Does YOUR Clutch Setup need a Shim? Measurement "A" is the distance between the surface of the bellhousing that meets the transmission to the tip of the pressure plate fingers. To get an accurate measurement, the clutch must be torqued properly. 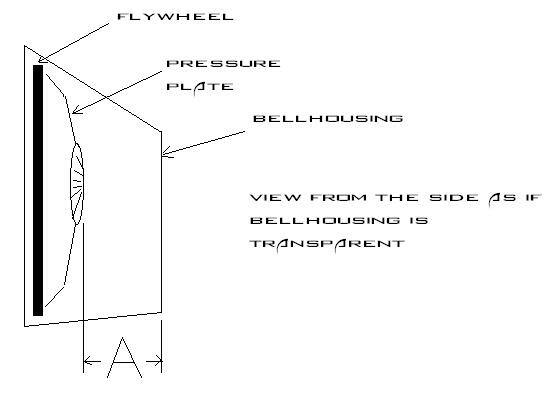 Measurement "B" is the distance between the throwout bearing surface to the transmission surface that meets the bellhousing. To get an accurate measurement, the slave spring must be removed and the bearing must be fully seated at the bottom of it's travel; resting on the slave's base. Once you've got your two measurements, make sure that measurement "B" is ~1/16" to 1/8" LESS than measurement "A". If you come up with more than 1/8", add an appropriately sized shim between the slave and the transmission in order to get the measurements where they need to be. If there is no difference between the two measurements, or if "B" is greater than "A", there could be a problem with clutch engagement which could result in premature clutch slip and eventually a total failure. We're always in pursuit of new ways to get you guys shifting as quickly & efficiently as possible. Determining if your setup needs a shim or not is quick, easy and cheap way to ensure proper function and long life out of your next clutch. Last edited by [email protected]; 09-13-2011 at 12:26 PM. Thanks for getting this info to customers, and, thanks for the consistent support of this community! P.S. Monster Clutches do NOT need shims! Owner/Operator of SNL Performance/Monster Clutch Co. Please do not send me pm's, email me at [email protected]!!!! We do it all! Nitrous, motor builds, turbos, superchargers, custom tunes, heads/cam installs, clutches, anything and everything! Thanks for the post Joey. I understand the "A" measurement, I can't visualize the "B" measurement though. Awesome, thanks a lot! So "A" is for the clutch and "B" is for the slave? No, the difference between "A" and "B" is the clearance required when the clutch is engaged. my spec stage 3+ didnt come with one , they forgot to put it in the box. Good post.It is probly the #1 reason clutches prematurely wear out. In my experiance it is needed to check on every single clutch setup.Atleast 60% of the SPEC's we do never need the shim and the burnt one's we've pulled had the shim when it wasn't needed.I like 1/8 -1/4" air gap to make room for clutch break in. One other bit of info that should be added is something that Joey already made note of in the original post. The tob must be seated against the base of the slave when taking your measurement. Sometimes in order to do this, the bleader will need to be loosened. If the TOB won't seat even with the bleeder cracked, there could be a problem with the slave itself which could also cause clutch engagement issues and premature clutch failure. Basically you're just looking for a little gap, and Slowhawk is correct. As the clutch breaks in the gap will become a bit less and less. Too much gap however, and there will be dissengagement and shifting issues due to a dragging clutch. Anybody have experience with the Exedy Hypersingle? I think you misunderstood my post. "A" is the measurement of the clutch, "B" is the measurement of the slave. With those numbers you find out what size shim, if any, is needed. Definately make this a sticky. Awesome info guys - Thanks! Here is some info from RAM's site on shimming. I have a dual disc I am about to install but I need to measure for the correct shim. Can someone also explain why an adjustable Master is needed? And also explain the proper way of setting one up? Quick Reply: Does YOUR Clutch Setup need a Shim?